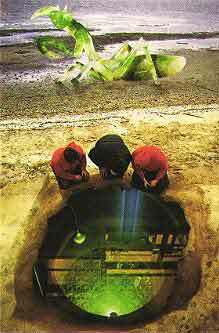 An underground or partly underground chamber in a Pueblo village, used by the men especially for ceremonies or councils. The KIVA represents the unbroken circle of the Earth. It is the meeting place of peoples who love the Earth. It is the church within her womb. The KIVA can take many forms. It can be a sweatlodge, a teepee during a peyote ceremony, the arbor of a sun dance, an ayahuasca ceremony under the canopy of the rainforest, a simple hole in the ground with a ladder protruding out of it, or the darkly lit chamber of a musician's studio. Anyplace where indigenous and modern people gather to worship in communion with the Earth, that is a KIVA. During the making of this album, Ron participated in several traditional ceremonies, and with permission from the elders of each, he brought back rare source recordings that are the basis for its structure. Although it is unusual for recordings of this nature to be made public, all of the parties who participated agreed on one thing, that it is time to share the special nature of what occurs within these ceremonies. There are four ceremonies explored on this album. In East KIVA, "Calling in the Midnight Water" initiated by Michael Stearns, is the Peyote ceremony. Peyote is a hallucinogenic cactus found in the Southwestern United States and Mexico. Here it is taken in a prayer ceremony as a sacrament for a healing. In the South KIVA, "Mother Ayahuasca" initiated by Ron Sunsinger, is an Ayahuasca ceremony. Ayahuasca is made from the bark of a hallucinogenic jungle vine from South America. It is taken here in ceremony to seek visions within the deeper self. 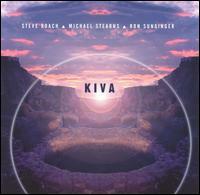 In the West KIVA, "Sacrifice, Prayer, and Visions" initiated by Steve Roach, is a Sundance. The Sundance is a high ceremony of the Native Americans of the central plains. It is a ceremony of renewal with the spirit world in which the core participants seek visions to become holy men.In the North KIVA, "Trust and Remember" is an Earth ceremony created by Steve, Michael, and Ron. It is three non-traditional people co-creating in a cave in Northern New Mexico with the energies of the moment.